Sometimes reality doesn’t mesh well with public perception. 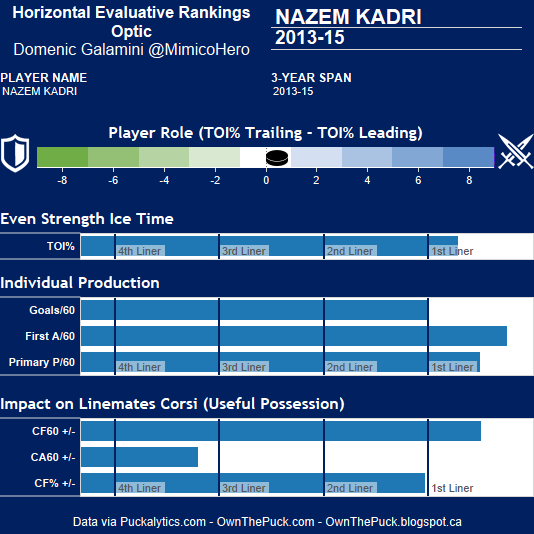 When it comes to Nazem Kadri, that is the case almost every time. Whether fans are complaining about his attitude, his effort, defense or point totals, no one ever seems to give him the respect his stats say he deserves. For instance, I wrote that stat for stat, he was better than Van Riemsdyk and I wrote that he was already the Leafs number-one centre and that he was primed for a breakout season in 2015-16. After writing these pieces, one comment kept coming up again and again: If Kadri is so good, why did he fail miserably every time he skated on the Leafs’ top line with Phil Kessel? Since that is both a popular sentiment and a wrong one, I thought I would explain why. To know whether or not Kadri was successful when given more opportunities on the first line, we first need to establish a baseline. In his first three full seasons in the NHL, Kadri played 199 games, at even-strength he scored 36 goals and 57 assists for 93 points. He had a Corsi rating of 47.3 on a poor possession team, but if you look at Corsi relative to his teammates, he has a 4.11% rating, which is about 45th in the NHL over this time (out of 700-0dd players, this is excellent). Kadri’s points/60, which is a stat to figure out how many points he scored relative to his ice-time, was 2.04, good for 44th in the NHL over the last three years, and 20th among centres. Keep in mind that while he did this, his most common line-mate was Joffrey Lupul, who is one of the worst possession players in the entire league. 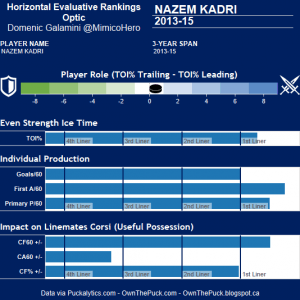 These stats are gauged at even strength and suggest that Kadri is an elite player: He scores points at a rate that is top 20 for his position, and his possession stats are elite in comparison to his teammates. Comparing him to his closest peers is also interesting: Kadri boasts superior possession numbers to both Ryan Johansen and Matt Duchene. He has more points than Johansen in less games, but less than Duchene who plays an extra minute per night. In order to see how Kadri performed with and without Kessel, I’ll refer to the “With You” charts on Stats.HockeyAnalysis.com. One of the first interesting things we see when looking at this chart is that in his three full seasons with the Leafs so far, Kadri’s second most common winger is Kessel, who he has skated with 515 minutes out of his total 2730 minutes. This works out to be just shy of 20% of Kadri’s total 5v5 ice-time. 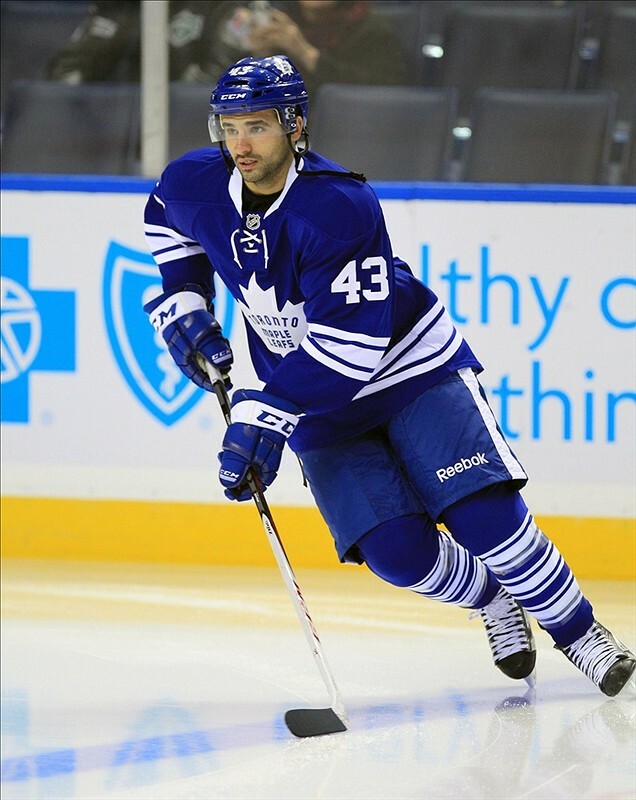 The second thing we see is that although Kadri’s three-year CF% is 47.3, it drops to 46.3 when he plays with Kessel. That isn’t surprising because Kessel usually comes with JVR and together they are a defensive nightmare. What is surprising, is that Kessel, who posts a 45.2% CF over the last three seasons in total, performs better than this when he is with Kadri (46.3%) and worse than his overall total when he doesn’t have Kadri as his centre (45.0%). The upshot: Kessel, whose strength is taking shots and scoring goals, get’s more shots when Kadri is his centre than at any other time he’s on the ice. Now, to be fair, Kadri’s possession totals with Kessel may seem only slightly better than Kessel does with Bozak, but because the range of Corsi is so small (40% to 60%), small variations are bigger than they seem. Still, slightly better is a long cry from “failed every time he played with him,” and, there is more to come. Possession is a nice concept and it correlates heavily to winning, but some people don’t trust it. Fair enough. But what about just regular old goals and assists? When paired with Bozak, Kessel averaged 2.8 goals for per 60 minutes of ice time, and 2.98 goals against (last three years, even strength). This is a losing proposition. It means that for the last three years, the Leafs’ best line (even though Kessel was one of the NHL’s highest scoring players during two of these three years) allowed more goals than they scored, and that the team would have literally been better off just not playing them. Now, whenever the coach had a lapse in his lapse of judgement and decided to put Kadri out with Kessel, they scored at a rate of 3.14 goals per 60 minutes. To put that in perspective, people who play with Crosby scored 3.41 goals/60 on average over the same time. Now obviously, this is a much smaller sample size, but that is a lot of offense to turn your back on in the name of Bozak. It also renders ridiculous cries that Kadri failed when paired with Kessel. Also important: Kadri and Kessel only allowed 2.79 goals against per sixty when paired together, which means they were a positive combination and the Leafs were a winning team when they played. So Kessel and Kadri combined to be a winning combination that scored at a near Crosby level pace and, more importantly, they outscored the opposition. Instead of capitalizing on this, the Leafs played their close-to-elite centre with one of the worst wingers in hockey (Lupul) and their close-to-elite winger with one of the worst centres in hockey. When you think what could have been, it’s pretty disappointing.